Attribute Store « Jorge's Quest For Knowledge! My ADFS environment has an attribute store configured to an ADLDS and for that I used the “ldapattributestore” that still is available in the codeplex archives (https://archive.codeplex.com/?p=ldapattributestore). Because that ADLDS instance was running on a DC with ADDS, I configured the ADLDS instance to use port 5389 for LDAP and port 5636 for LDAPS. 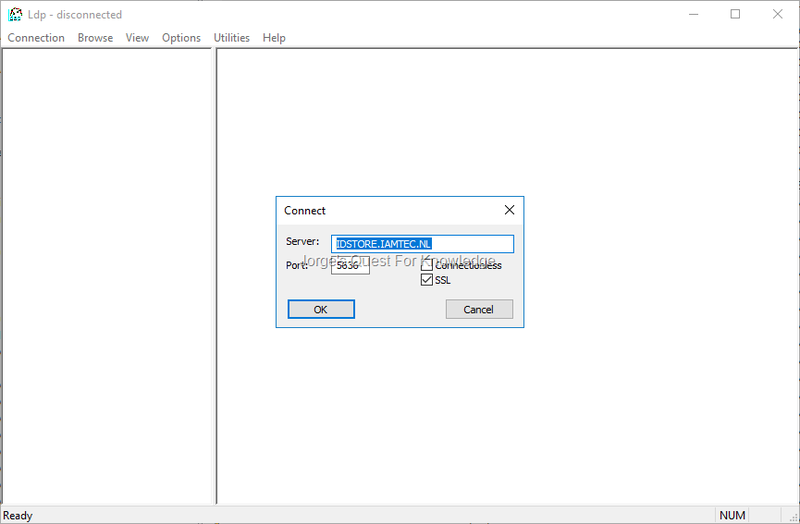 The “connection" string” for that LDAP Attribute Store was configured to use a secure connection (i.e. LDAPS) over port 5636. As I was checking functionality of my test environment I also tested this part by targeting the “Show My Claims” app (https://jorgequestforknowledge.wordpress.com/2015/07/04/displaying-the-issued-claims-in-a-security-token-on-screen/) that dives into that LDAP Attribute Store and displays specific claims on screen. As I did not use my test environment for some time, several certs were expired and needed replacement. I opened the Local Machine certificate store and replaced every certificate that was expired or was going to expire soon with a new certificate using the exact same subject and SANs. After updating all certificates I started configuring and testing every single application using a certificate. So as you can imagine at some point in time I ended up with ADFS, the Show My Claims web site and with that the LDAPS attribute. As an initial test I accessed the Show My Claims web site and due to the Issuance Transform Rules ADFS needed to dive into the ADLDS attribute store to source claims being displayed on screen. Unfortunately that failed. 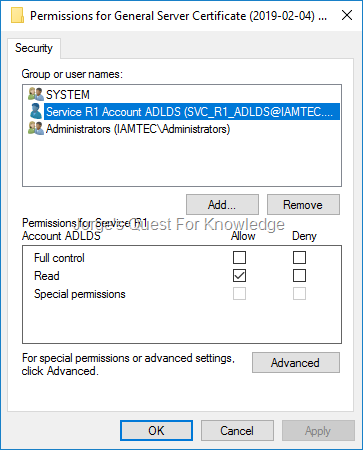 Looking at the ADFS Admin Event Log, ADFS was having issues accessing the Attribute Store. Those issues were related to the usage of LDAPS. In that case I needed to start the basic testing of LDAPS through the good old LDP and see what was going on. 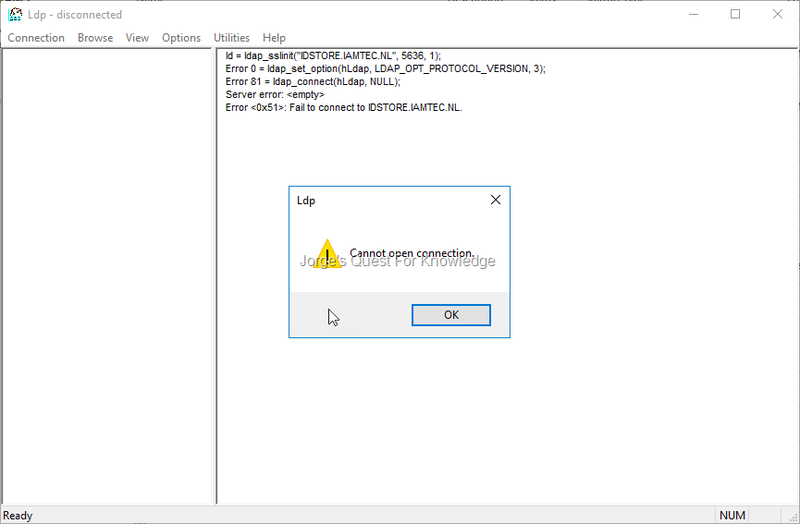 After enabling debug logging for SCHANNEL I tried it again with LDP and in the SYSTEM Event Log I saw the following error. 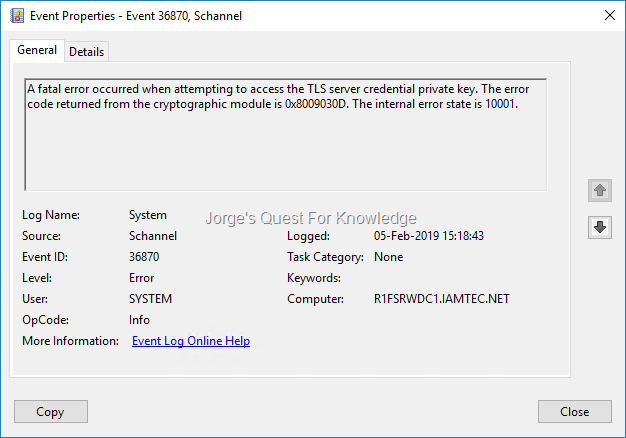 A fatal error occurred when attempting to access the TLS server credential private key. The error code returned from the cryptographic module is 0x8009030D. The internal error state is 10001. The attached data contains the certificate. 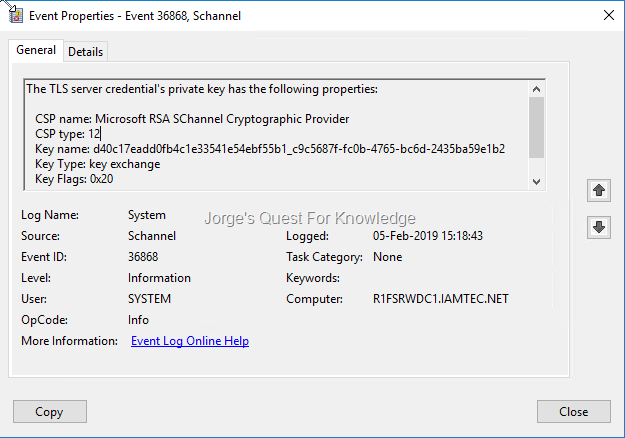 The event shown above mentioned the private key being used by the the ADLDS instance, but it still did not mention which certificate was being used. Switching to the details TAB, it told me more about the corresponding certificate that was being used. 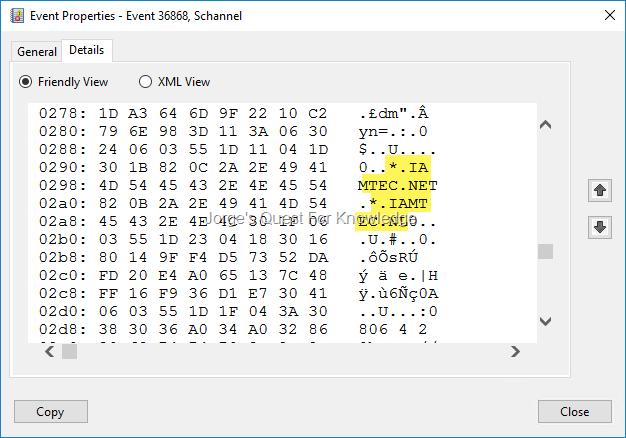 Going through the data I noticed it contained the SANs “*.IAMTEC.NET” and “*.IAMTEC.NL”. That was surprising to me as the certificate that envisioned for the ADLDS only contained “IDSTORE.IAMTEC.NL” as subject and as SAN. What I never realized was that my wildcard certificate was going to be used first before even considering the usage of the certificate that contained the more specific subject and SAN. 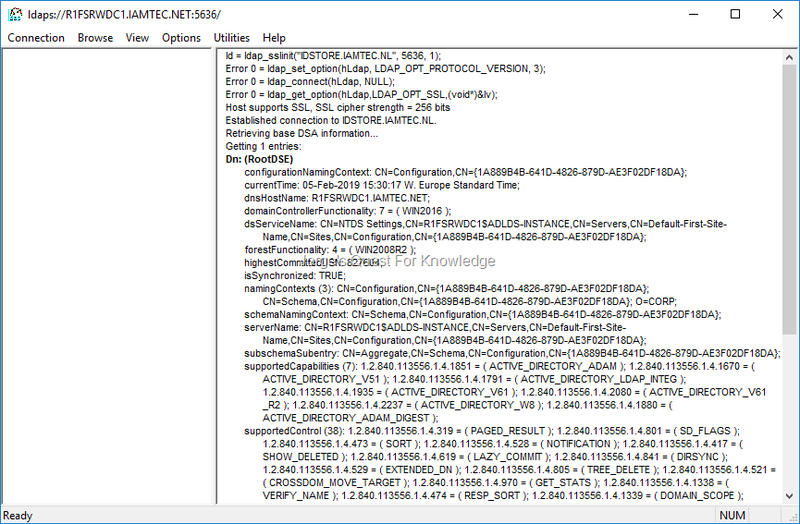 As displayed below I permissioned the private key that belonged to the wildcard certificate …. Retried my test with LDP as shown below….